The basic LPDA structure is a very popular for applications where a linearly polarized broadband antenna of simple construction, low cost and lightweight is required. The Orthogonal LPDA expands on the LPDA by combining two identical 'ordinary' log-periodic dipole antennas, orientated orthogonally with respect to one another. Each co-located LPDA can then be fed independently with the correct phase in order to obtain the most versatile polarization combinations, namely linear, dual-linear, right-hand circular (RHC) and left-hand circular (LHC). As with the Linearly polarized LPDA, the bandwidth of this antenna is theoretically unlimited, being classified as a logarithmic periodic structure, with achievable bandwidth ratios of up to 150:1! 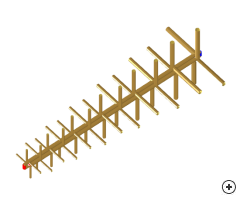 The typical gain of this antenna is between 6 and 12 dBi.